LINCOLN, Neb. 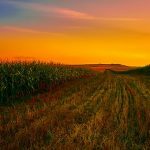 (AP) – The latest Census of Agriculture for Nebraska says the number of farms in the state has dropped 7% from five years earlier. The U.S. Agriculture Department said in a news release Thursday that there were more than 46,300 farms in Nebraska during 2017. They covered 45 million acres (18.2 million hectares) – down 1% from the 2012 census. The average farm in 2017 had 971 acres (393 hectares), compared with 1,035 acres (419 hectares) five years earlier. The department report says the total value of agricultural products sold in 2017 was $22 billion, down 5% from 2012. The report also says 58% percent of the value was in livestock and 42% in crops. Average net income per farm in 2017 was more than $87,800 – down 19% from 2012. Nationally, the Census shows the number of farms and ranches in the U.S. has fallen but the remaining operations are larger and are responsible for a higher percentage of agricultural sales. The Thursday report marks the 29th release since the government began collecting the data in 1840. Since 1982, it has been released every five years.